Stay current on the law in our rapidly changing society. Make sure your mandatory MCLE hours are accurately and timely reported. When it comes to legal research, attorneys need fast, trustworthy, and straightforward tools, and the State Bar of Texas is the first and only bar association to offer its members free access to both Casemaker and Fastcase. The State Bar offers members access to resources, goods, and services—including the Texas Bar Private Insurance Exchange and the Texas Member Benefits Program—to help them in their professional and personal lives. The State Bar of Texas provides resources for new attorneys. Information is available on professional requirements, legal ethics, the Texas Young Lawyers Association, law practice management, and State Bar sections. Every active State Bar of Texas member must complete a minimum of 15 hours of accredited CLE during each MCLE compliance year. Texas Bar Connect, a private social network for Texas attorneys, is a great way to show off your skills and expertise and share knowledge with your colleagues. Use the same login and password as you do for your My Bar Page. The Texas Young Lawyers Association produced a pocket guide to understanding the rules governing lawyer communications in social media. The State Bar’s Professionalism Committee established an online database that matches Texas bar associations with knowledgeable speakers interested in discussing professionalism and ethical matters. The State Bar provides non-binding, non-confidential advice to licensed Texas attorneys on ethics questions, including information on how to access the rules and find ethics opinions and caselaw to help them make decisions. Advertising Review requirements help ensure that attorney public marketing efforts comply with ethical requirements created by the Texas Supreme Court. 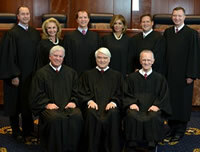 The Texas Supreme Court, composed of the chief justice and eight justices, is the court of last resort for civil matters in Texas. The Texas Bar College acknowledges Texas attorneys who attend at least double the Continuing Legal Education required by the State Bar of Texas. Every lawyer should have a plan in place to protect clients and colleagues for the time when he or she no longer can practice. In 2014, the State Bar Aging Lawyer Issues Task Force issued a report to the State Bar Board of Directors. The task force wanted to develop resources for attorneys on issues related to aging, such as transitioning to retirement, mental health issues, and staying connected to the community. An attorney who is board certified has relevant experience and special competence in a select field of law. The Texas Lawyers’ Assistance Program provides confidential help for lawyers, law students and judges who have problems with substance abuse and/or mental health issues. Texas Bar Career Center is the destination for exciting legal job opportunities and the best resource for qualified candidates within the legal industry. The Lawyer Referral and Information Service connects member lawyers with clients so that you can build your business. The Texas Young Lawyers Association is known as the public service arm of the State Bar of Texas. This TYLA initiative focuses on trailblazers, lawyers who were the first in their families to go to law school. The Law Practice Management Program provides members with information on starting, maintaining, growing, or closing a practice. Free resources include how-to brochures on everything from running a paperless office to cloud computing. The Texas Opportunity & Justice Incubator, or TOJI, is the first legal incubator designed exclusively for Texas-licensed lawyers who want to build sustainable practices serving low- and modest-income Texans. TexasBarCLE delivers high-quality CLE programs and products in a variety of media to Texas lawyers whenever and wherever desired—on exactly the topic needed.